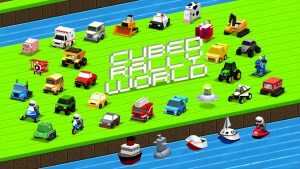 A game recently released for both iOS and Android this past November is Cubed Rally World by developer Jared Bailey (under the corporate name “Nocanwin”). 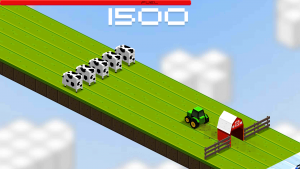 It’s the latest in a series of games using the ‘cubed’ motif of simple 8-bit graphics drawn in a 3D layout. I’ve had the best time playing and sharing this game with friends and family, and I’d like to share it with you here. Getting to the game is standard-issue; just download the game from the Play Store and open it up. Once in, you’re free to explore the game at your leisure. 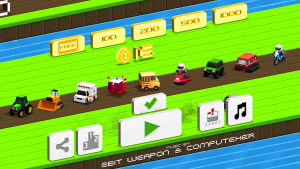 The title screen also serves as a ‘master menu’ screen, where you can choose your vehicle to race. As far as options, you only have a couple: turn the music on/off, buy additional coins (more on this soon), and link out to a premium ad-free version of the game (for $4.99). Back to selecting your vehicle….while there is a plethora of vehicle types to choose from in a lineup-style on the title screen, you are only given a single simple car to start out with. So choose that one and off we go! After selecting your vehicle, you transition to the race screen with your vehicle waiting at the starting line. 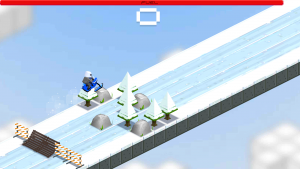 The race course is made of 5 parallel tracks, and your controls are a simple left and right button on their respective sides. After a quick countdown (“3, 2, 1, Go!”), your vehicle takes off at a constant speed along the course. There are multiple courses, and which one you find yourself on (street, water, sky, dirt, farm) is mainly dictated by the type of vehicle you are in (car, boat, helicopter, dune buggy, tractor, etc). 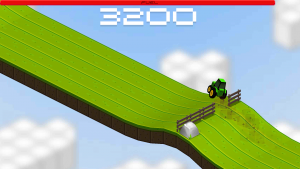 Each course is littered with both stationary and moving obstacles. Your job is simply to avoid these obstacles by tapping left and right to switch amongst the 5 lanes. 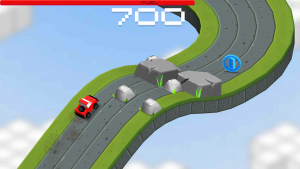 The variety in the obstacles are a highlight of the game as they are relevant to the vehicle and course you are on and in how they attempt to end your race. Included in the lanes are multiple types of ramps/jumps to give you some added excitement. You can even add to your point total by drifting around corners (you can’t really control this, but everybody I had try the game on my phone commented on how they liked this). While maneuvering down the course, there are also some goodies you’ll want to try to pick up. The coins you’ll want to collect as they are how you acquire the other vehicles shown in the title screen (different vehicles have different prices). The blue icons add to your point total (my kiddos & I found some healthy competition in trying to best the current high score). The clock icons give you a very temporary “bullet-time” slo-mo visual of particularly tricky course areas upcoming. And there are gas tanks you want to grab because during your course run there is a fuel bar across the top of the screen that is constantly dwindling down. Without grabbing gas icons, you will run out before finishing your race. The game is a great combo of simple and challenging. First-timers that I’ve had try this title have zero problem getting an immediate handle on it. But because one collision with an obstacle equals starting over at the start, it forces players to really focus and jump right back in once they screw up. And try as I might, I could not find someone who could get mad at this game. Even when trouble was had in getting through a particular course, it only caused a giggle and a “let me try that again”. There really is no end to the game. The more vehicles you buy, and the more points you score, the game just continually gets longer and even links multiple course types together into super-long courses. If you start by choosing a boat, it will only get you so far as at some point you’ll cross a faux-finish line and immediately switch to a randomly-selected different vehicle and respective course. Then another, and another. Good luck to your patience level. The hallmark of the game is the ‘cubed’ motif mentioned earlier. It’s a simple but well-done 8-bit world, drawn in a 3D arrangement that isn’t commonly seen in mobile gaming. The colors are primary and really pop off the screen without being garish at all. The vehicles and courses are varied enough that they make you want to pursue and try them out. My kiddos quickly became obsessed with trying to collect all the vehicles they could! The sound is simple 8-bit nirvana with all the electronics beeps and boops you can handle. Again, if it happens to be a little more than you can handle, you can always toggle this off in the title screen. Let me put it this way: Cubed Rally World has stayed on my phone longer than any other app or game I’ve reviewed in a while. And given my propensity to move through apps, that’s a pretty impressive statement. The game is very easy to access at the start, offers enough eye candy to be fun, and provides enough variables to keep you coming back. 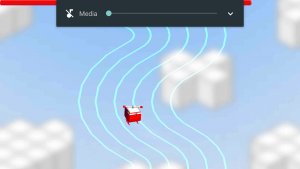 Click here to download Cubed Rally World from the Play Store. Cubed Rally World is a colorful, simple, but still challenging racing game that folks of all ages will enjoy playing and challenging each other on.